Our electrical wall cover plates are handcrafted of wrought iron with a baked-on powder coating. 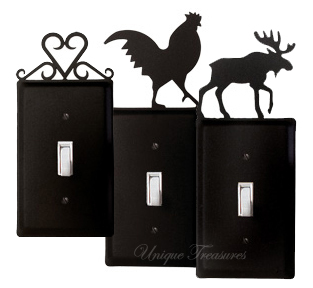 Unique Treasures has a large variety of silhouette designs to complement any home decor. Switch, outlet, and GFI/Rocker configurations are available to fit almost any need. Orders for made-to-order/custom items are non-cancellable once the order is placed. Allow up to 12 to 16 weeks for shipment.